Plochmann Lane: Levon Helm Dirt Farmer autographed / framed cd. 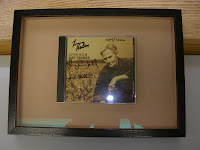 Levon Helm Dirt Farmer autographed / framed cd. Recently had this amazing album w/ limited edition autographs by Levon & Amy Helm & Larry & Theresa Campbell framed. Emmylou Harris & Mark Knopfler album. Levon Helm wants you to rate his music.